So recently there was a deal posted that if you download the glue store app, you get $10. Obviously I wanted to see what I can get for free. Considering the fact that The glue store sells mostly expensive brands I was for the hunt to get something for less than $10. It wasn’t easy since they don’t have filter from low to high. Anyways I finally found these socks for $4.99. If you get two of them that will be 9.98. Use your reward and that will bring it down to $0. Use click and collect to make it completely free. No payment method will be required from you. When it says check your address, just ignore it and press continue. It will still let u check out. Just placed an order on my daughters phone. Someone quickly tell iforgotmysocks, he's been waiting for a bargain like this!!! Don't forget to tell JV's Tattered Socks too! yep used it for my birthday rewards, also got some dr martens shoe laces for $10. Wonderful, tell your daughter we said thanks also! How long does it take for the email with the code to come through? The balance should appear on the app tomorrow. … because showing your socks is so embarrassing? Most men do this now. It's not really "in" to have socks showing, for casual wear. Sadly not many places around so only really worth while if you are close to a store for click and collect. Yeah but it's only 0-$25 i think. I found a few t-shirts that were on clearance at $10 but they looked kinda crap. Took a day but I got it. Hi OP, any tips on the checkout issue reported by a few users below? Dont know why I am unable to checkout. Receiving this stupid error. same. Can't seem to get around this either for some reason. Tried on both browser and app. I tried doing that as well. Not sure if there's a mistake in what I'm doing. It still doesn't work. It takes me right back to the previous page where the error appears. Can you please share with us how you check out? Is it through a desktop, mobile, or app? Ps: make sure you have saved the c4c address, then type in your details. @donamique: Did you use your voucher on the socks, or something else? @Nooni: Yup 2 pairs of socks…ok too much trying now have to stop myself lol. @Nooni: All good. What address do you use? Maybe the state matters? @Nooni: Ok give up completely. Lol good effort though! @Nooni: But you couldn't have placed another free order… click and collect orders must be over $10.00 and not on sale. Edit: It turns out that they may have changed the terms of click and collect shortly after this deal was posted- the part specifying the minimum spend is a recent introduction, as it wasn't present on archived webpages on the Wayback Machine found here which date back as late as the 16th of March this year. Gave up as well! No more shopping at Glue Store for me. Complete website fail! 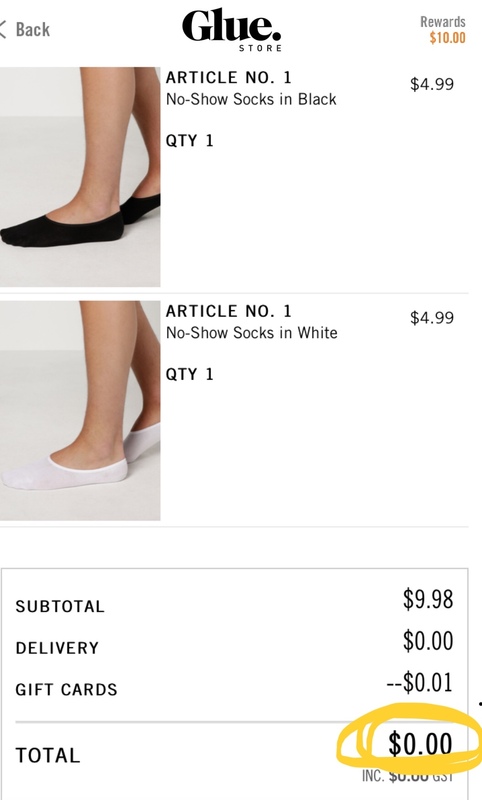 Two pairs of socks only cost $9.98 — two cents short of the magic amount! So yeah for C&C the minimum amount is $10. So i added another pair of socks and applied the $10 voucher, brought it down to $4.97 C&C. Was able to finish the order. The $9.98 order can no longer be click and collected. According to Glue Customer Support: "We have updated our terms and conditions so all click and collect orders must be over $10. This means unfortunately orders under $10 that are click and collect will no longer be processed." OP, we can always use the $10 in store right? even for the sale item T-Shirt which worth $10?